We’ve never been to the East Coast, but we have always wanted to go. We’ve dreamed of someday visiting Acadia National park, seeing the Atlantic Ocean, and eating fresh lobster. There’s just something about the East Coast that has always appealed to me. That’s why I love this next reader feature. Sueanne’s makeover perfectly embodies that East Coast vibe. When Sueanne first suggested the idea of renovating the pop up camper, René was hesitant. 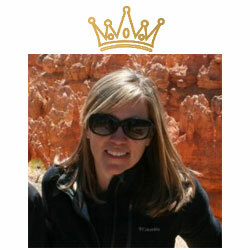 She showed him all the fabulous reader makeovers on this blog, though, and he eventually relented. They both agreed on a tight $150 budget, with the expectation that they would upcycle some supplies and reuse things they had laying around the house. They are parents to a 14-month-old baby girl, so their only free time was in the evenings after she was sound asleep. 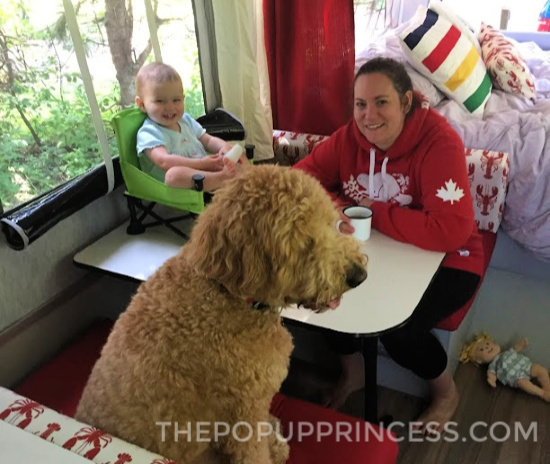 Each night over a two week span, Sueanne and René would would put their daughter to bed and bring the baby monitor out to the camper to get to work. 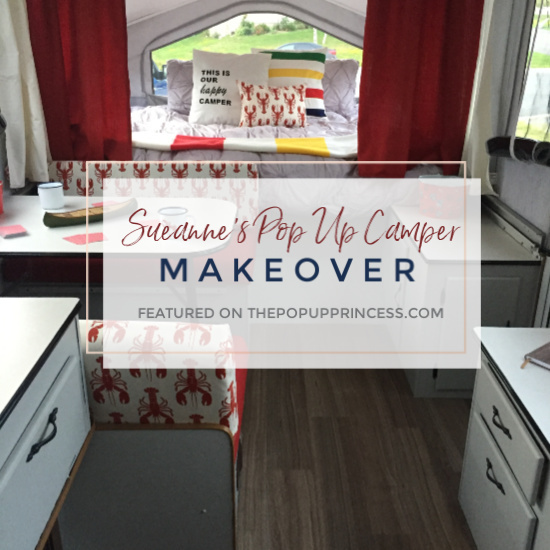 Sueanne started her remodel by removing all of the curtains and cushions and cleaning the entire camper. They were fortunate that their camper had very little mildew or dirt. Then they removed all of the cabinet doors and drawers, lightly sanded the cabinet bases, doors and drawer covers, walls, and dinette area. Proper preparation is definitely the key to a good paint job, so if you are looking for more tips on painting your cabinets, be sure to check out our post here. 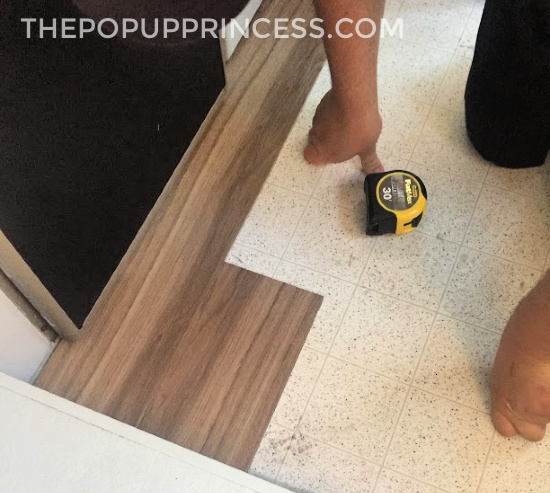 Sueanne used Zinsser primer like this one to cover all the ‘wood’ surfaces. It dried really quickly in the summer heat, which made the painting process much faster than they had anticipated. Then they used Benjamin Moore paint in “Coventry Gray,” which they had left over from a project in their house. Once the paint was finished, Sueanne could see her project coming to life. It made her really excited to keep going. She removed the existing cabinet hardware and used black spray paint to cover the gold hinges, door pull, and the original faucet. To cover the gold and wood t-trim along the countertops, Sueanne selected a Krylon Fusion for Plastic spray paint in black. The counter tops themselves were in excellent shape and complimented their color scheme, so Sueanne and René opted not to replace them. 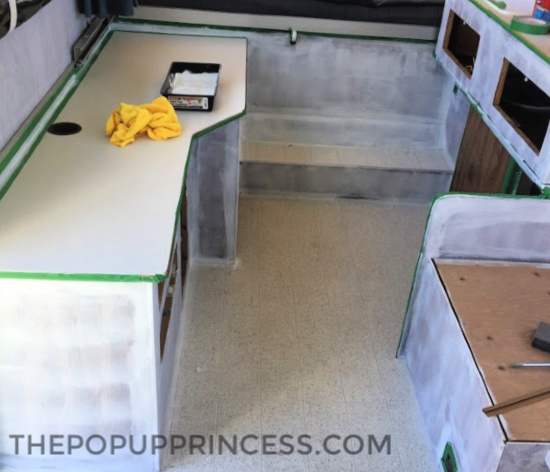 Sueanne knew from the beginning that she would replace or recover the floor of the camper, as it was scratched, yellowed linoleum. They purchased one box of vinyl self-adhesive wood-look planks from the local hardware store, thinking it would be enough. Much to her dismay, it was not, and she had to drive four hours to get a second box to complete the job. The local store had already sold out of her flooring, so that miscalculation tacked an extra $50 on to the budget. 🙁 As far as the installation went, Sueanne said it was super easy. In fact, they were surprised how easy the floor was to lay, and it turned out beautifully. 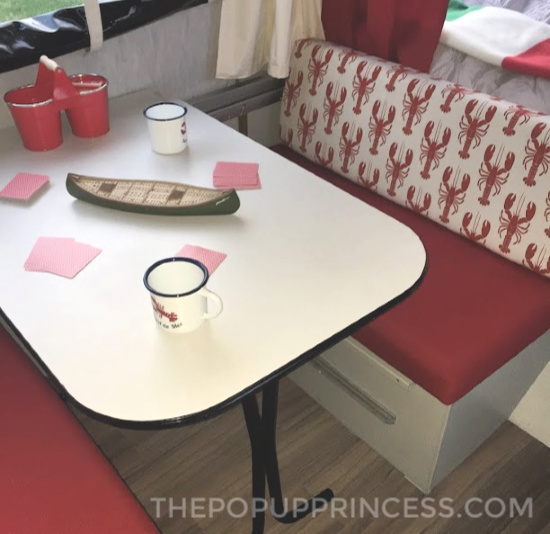 Initially, Suzanne planned on a blue geometric print theme for her makeover, but she came across this lobster fabric and fell in love. René hails from a small East Coast fishing community, and it only seemed fitting they paid homage to that with the little details in their remodel. Sueanne sewed until the late hours of the evening–and sometimes into the wee hours of the morning–recovering the dinette cushions and making the curtains. She followed our cushion tutorial (found here), making a few modifications as she went along. She skipped the zipper, opting instead to hand sew the opening closed. Sueanne can easily spot clean the small stuff, and if there is anything that requires heavier laundering, she can always remove the stitching and re-sew the cover back together after washing. 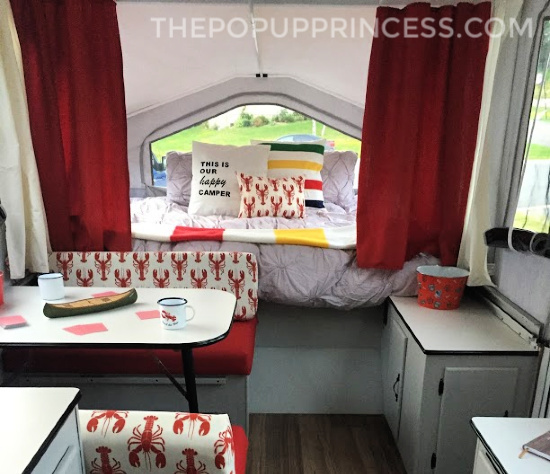 Sueanne created the bunkend curtains by using the existing curtains as a pattern and cutting new panels from matching red fabric. She clipped the mesh panel and tabs from each curtain and attached it to each new bunkend panel. For the side curtains, she purchased inexpensive off-white blackout curtains at $6 a panel. She cut and hemmed the curtains to the same length as the old panels and used the existing clips to attach the new curtains to the original tracks. Sueanne also made most of the throw cushions, adding some Canadian themed items she and René had around the house. They used a bedding set they already had for the queen and purchased an inexpensive red quilt for the double. Lastly, Sueanne added a couple of Hudson Bay Company items to complete the look, as her grandparents often had the iconic stripes in their homes. The familiar pattern reminds her of them. 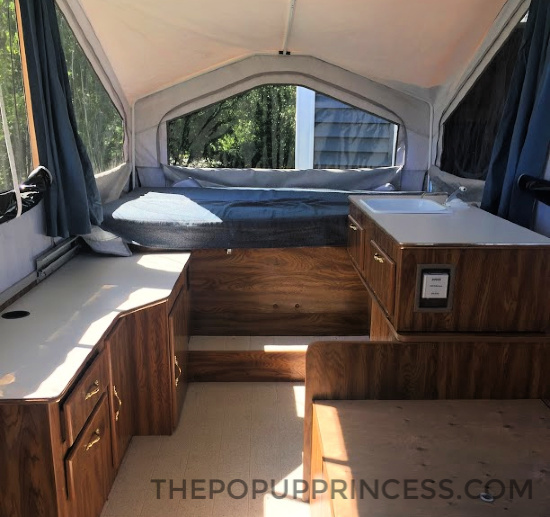 The camper door suffered some water damage in its previous life, so René removed the bottom door panel (interior and exterior) and scraped away all the damaged wood and foam. He cut a piece of thin plywood to fit the door bottom and re-inserted the exterior piece using waterproof caulking. Because the interior piece now differed from the rest of the door, Sueanne covered it in some outdoorsy wallpaper she had left over from her daughter’s nursery design. The icing on the cake is the “Happy Camper” pop up artwork she added to the door using a Sharpie oil based paint marker. Sueanne and René are both so proud of “Bertha,” as they have fondly named her. Their maiden voyage was to Prince Edward Island, a province just over from their home in New Brunswick. The very next weekend, they returned to their own province to join Sueanne’s sister’s family in Fundy National Park. They had such a good time and made so many wonderful memories that they can hardly wait to get out again. 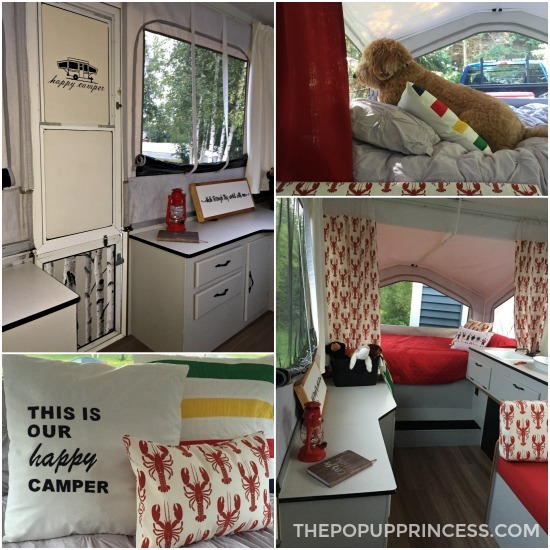 While Bertha sits tucked away for the winter in the garage (it is currently -4 degrees Fahrenheit in New Brunswick), Sueanne is making more camper modification plans and reservations for next year. Nice work Sueanne and René. Thank you so much for sharing your East Coast themed vacation home with us. It’s beautiful! What an inspiring makeover! Very bright and designer looking.